The creation of a tag can be considered? Warning, big explanatory block. (I apologize for my potential spelling errors, I use google trad). I love this mod, and I have already created a lot of goals and rewards. The problem is that all these goals and rewards are random, and it does not really make sense. Creating different tags (in a new config file), and giving goals and rewards the same tags, will allow to create custom missions, with appropriate rewards. Example: Creation of the tag "Blacksmith". Creation of various Goals / Rewards with blacksmith as tag. When a new bounty appears, with the blacksmith tag, only the goals and rewards with the blacksmith tag are chosen. I think it would be a good addition,and i already have plenty of idea for my tag (blacksmith, alchemy, trade, hunter, farmer, ...). And I think that would make it good in rp servers too. Hey I was Wondering if you could show how to change the reward to a different item like maybe emerald? Please that would help me out a lot. It should be pretty simple to do, just edit the "config/bountiful/rewards.json" file, adding a new entry for "minecraft:emerald"! I really like your mod it's fresh! never seen anything like this before. Yes, just edit config/bountiful/bounties.json. To figure out what the registry names of the entities are, just run "/bo entities". 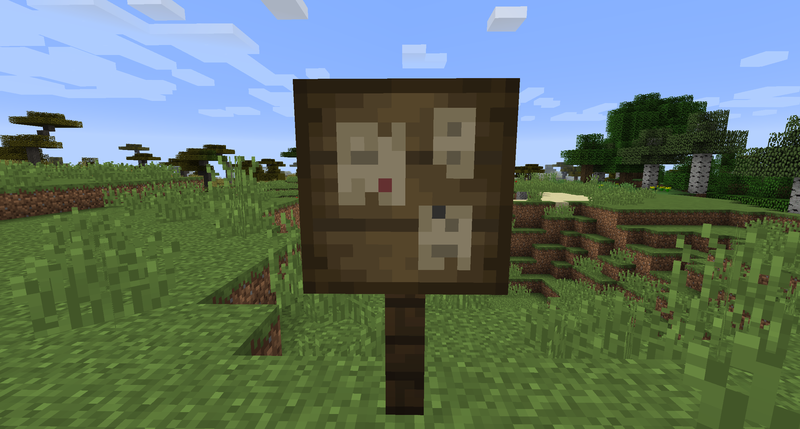 You ever considered making this a 2x2 version instead 2x1? I'm not quite sure what you mean. Could you elaborate? Like a chest. 2 blocks into wide or even a little bigger? If it would look better in a more wide variant. But i guess you already tried that. If you mean the block size, I like to keep it simple. 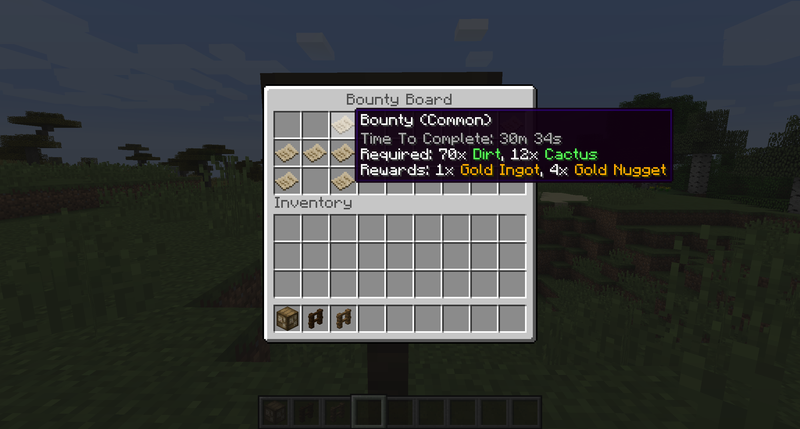 I will hopefully be adding an alternate sign option in the future so that you can put the bounty board on a wall! If you mean inventory size, I'm sticking with a normal, "single chest" inventory size. I did try the double chest size, but found it to be overly cluttered when close to full, and having that many bounties available at once is a little bit much compared to what I had originally envisioned. I'm having some trouble configuring the .json files to some specific items. 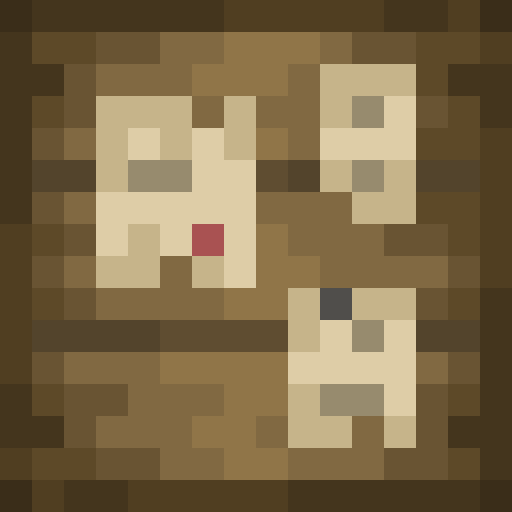 In my case, I want to add lapis lazuli as a reward, and it's name in minecraft 1.12.2 is "minecraft:dye", with an id of 4. My friend and I can't find any way to specify the id, so the reward in game is an ink sac instead, as it is the default form of minecraft:dye. The same goes for any variations of wood, etc. For some reason I can't get this mod to work! Any help? I really wanna use it. Hey, that error does not tell me anything about the problem. You should report all issues to the issue tracker here, and include the Minecraft version, Forge version, Mod version, as well as the error log (and a mod list would be helpful as well). I read the crashlog on the GitHub. I have not GitHub account, so I'll reply here. I had exactly the same exception with the old version of Forgelin. Try to update it, if it's not the last (my is 1.8.2). In the future, reply on GitHub on the issue. I posted a response there! Add more default quests and rewards!